It is always surprising how thoroughly modern a photograph looks in colour. This image from 1906 could almost be a promotional one from the latest BBC historical drama. We know nothing of the people sitting in the car, only that the image is from an early British motoring magazine. But we cannot match the model exactly to the list given in the major French work on Chenard & Walcker published in 1998 by Claude Rouxel et al. We suspect that it may be the Type N, designated 14/16 HP and 14CV in their book. Indeed, for 1906, they mention the innovations of pressed steel chassis and magneto ignition – both consistent with the British announcements of the time. Incidentally, the report in Motor News of 1st December 1906 mentions the new model and that it was marketed by Walter Gutmann, of 2 Bury-street, Mary Axe, London, E.C. The company was founded in 1898 in Asnières-sur-Seine, and moved to Gennevilliers in 1908. Ernest Chenard was a railway engineer and maker of bicycles, and joined with Henri Walcker, a mining engineer, to make motor tricycles. They formed their car company in 1900. They went public in 1906 – which perhaps explains the flurry of publicity in that year, and the trouble taken to pace a colour image in a British publication. 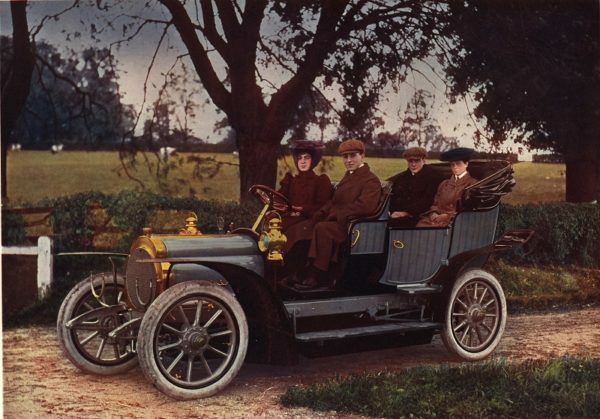 In 1910 they made over 1500 cars, and were the ninth largest car maker in France. In 1923, their 3-litre car with overhead camshaft was the winner of the first le Mans 24-hour race. Sadly, the company was always undercapitalised. Unable to modernise from the largely hand-building methods used from the beginning, Chenard & Walcker went bankrupt in 1936 and was taken over by Chausson. But let us forget the decline, and revel in the elegance of this colour image from the company’s better years.